“My Outlander Thing” by Gavin McNett is a great article about how Diana Gabaldon’s Outlander series defies genre pigeon-holing. While these books may not be everyone’s “cup of tea”, don’t disregard them simply because some publisher/bookstore decided to label them romantic fiction. It is a fiction book with its fair share of romance to be sure, but there is so much more. 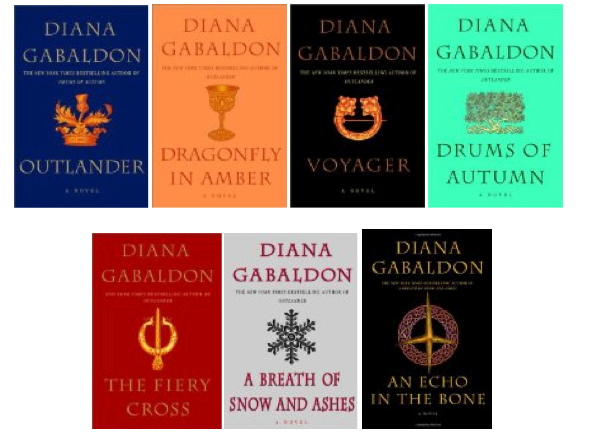 In college, I discovered a series of books by Diana Gabaldon. 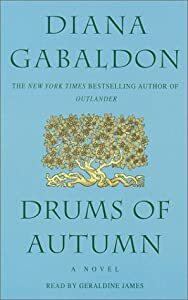 The first book is called Outlander, and the entire series contains some of my most favorite and most read books. It has all of those things I love: history, Scotland, time travel, some excellent bodice-ripping, true love, intrigue, cliffhangers, and rich characters. Last year I discovered knitting. This passage from Diana Gabaldon’s Drums of Autumn combine the two. Swoon!! The basket was full of dyed skeins of wool and linen thread. Some I had been given by Jocasta, some I had spun myself. The difference was obvious, but even the lumpy, awkward strands I produced could be used for something. Not stockings or jerseys; perhaps I could knit a tea cozy—that seem sufficiently shapeless to disguise all of my deficiencies. Jamie had been simultaneously shocked and amused to find that I didn’t know how to knit. The question had never arisen at Lallybroch, where Jenny and the female servants kept everyone in knitted goods. I had taken on the chores of stillroom and garden, and never dealt with needlework beyond the simplest mending. “Ye canna clickit at all?” he said incredulously. “And what did ye do for your winter stockings in Boston, then?” “Bought them, “ I said. He had looked elaborately around the clearing where we had been sitting, admiring the half-finished cabin. “Since I dinna see any shops about, I suppose ye’d best learn, aye?” “I suppose so.” I dubiously eyed the knitting basket Jocasta had given me. It was well equipped, with three long circular wire needles in different sizes, and a sinister-looking set of four double-ended ivory ones, slender as stilettos, which I knew were used in some mysterious fashion to turn heels of stockings. “I’ll ask Jocasta to show me, next time we do down to River Run. Next year perhaps.” Jamie snorted briefly and picked up a needle and a ball of yarn. “It’s no verra difficult, Sassenach. Look—this is how you cast up your row.” Drawing the thread out of the closed fist, he made a loop around his thumb, slipped it into the needle and with a quick economy of motion, cast on a long row of stitches in a matter of seconds. Then he handed me the other needle and another ball of yarm. “There—you try.” I looked at him in complete amazement. “You can knit?” “Well of course I can, “ he said, staring at me in puzzlement. “I’ve known how to clickit wi’ needles since I was seven years old. DO they not teach bairns anything in your time?” “Well,” I said, feeling mildly foolish, “they sometimes teach little girls to do needlework, but not boys.” “They didna teach you, did they? Besides, it’s no fine needlework, Sassenach, it’s only plain knitting. Here. Take your thumb and dip it so, …” And so he and Ian—who, it turned out, could also knit and was prostrated at mirth at my lack of knowledge—had taught me the simple basics of knit and purl, explaining, between snorts of derision over my efforts, that in the Highlands all boys were routinely taught to knit, that being a useful occupation well suited to the long idle hours of herding sheep or cattle on the shielings. “Once a man’s grown and has a wife to do for him, and a lad of his own to mind the sheep, he maybe doesna make his own stockings anymore,” Ian had said, deftly executing the turn of the heel before handing me back the stocking, “but even wee ladies ken how, Auntie.” I cast an eye at my current project, some ten inches of a wooly shawl, which lay in a small crumpled heap at the bottom of the basket, I had learned the basics, but knitting for me was still a pitched battle with knotted thread and slippery needles, not the soothing, dreamy exercise that Jamie and Ian made of it, needles clicking away in their big hands by the fire, comforting as the sound of crickets in the hearth. This excerpt can be found on pages 520-21.